As the Vietnam War began to heat up, author Robin Moore’s war novel Tales Of The Green Beret became a bestseller. In 1966 the book was used as a springboard for a comic strip of the same name. The strip, supposedly written by Moore (but actually written by yeoman comic strip ghost-writer Elliot Caplin) was introduced to newspaper readers on April 4, 1966. Sporting art by the master of hard-bitten war comic books, Joe Kubert, the strip was an instant success. Kubert’s art style was perfect for the strip – every bit as gritty, bloody and terrifying as the real thing being broadcast on the evening news. As casualties quickly mounted in Vietnam and the anti-war movement gained traction, newspaper editors started to think twice about running a comic strip about the Vietnam war. Presumably it was lagging strip sales that caused Joe Kubert to jump ship after a little more than a year and a half (his last Sunday was 1/7/68, his last daily in mid-week on 1/10/68). John Celardo took over the art, and as good as he might be, he just couldn’t maintain the intense flavor of Kubert’s version. The strip limped along, losing papers fast, and was finally put out to pasture on July 21, 1968. Can anyone give truth to the rumor that it ran daily only from September 20, 1965 to December 11, 1965? Supposedly as a sort of tryout. Do you recall where you heard the rumor? That’s a new one to me. of where I got those dates. of E&P as a source. Scroll down to Robert Moore. 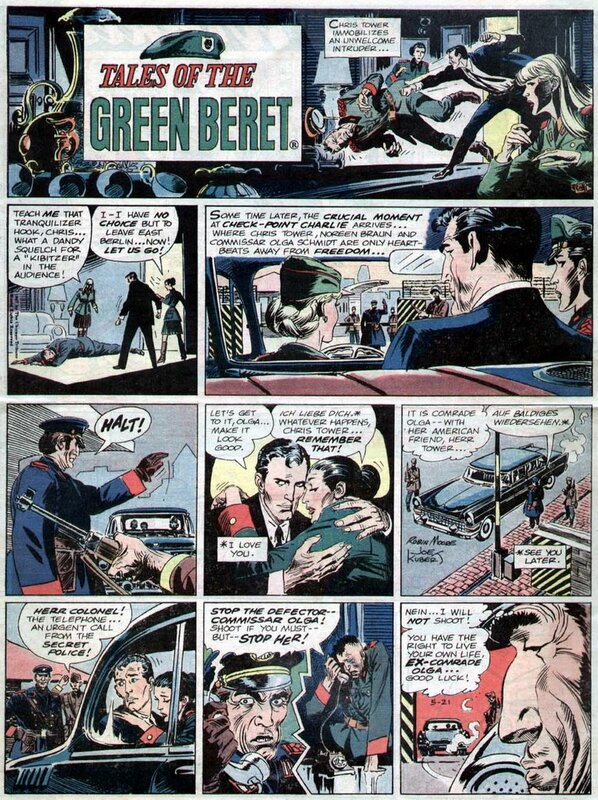 Green Beret strip that claims to be from 1965. But where I originally found the dates, I don’t know at the moment. I have the entire strip from 1965, collected a day at a time when published in our local paper when I was a paperboy back then. It ran in the Fond du Lac Commonwealth Reporter starting September 18, 1965 till December 18 (1965) and was published six days a week in our paper, Monday through Saturday. It was copyrighted 1965 NEA. Thanks, Anon, for the info. I have access to that paper. The actual dates are 9/27 – 12/18/65. Definite proof that NEA had it before the Trib, and the ones I looked at do seem to be different material. I’m trying to find a newspaper that ran Tales of the Green Beret after 1/20/68 – anyone know of any? Macon (GA) News, for one. Thanks Allan – Is that newspaper available online? I didn’t find it on Newspaper Archives or Google Archive. I don’t know if it’s online, I reviewed it on microfilm and bound volumes.